This giant squid called Architeuthis dux and measuring 30 feet long washed ashore in the Spanish community of Cantabria on Oct. 1, 2013. Updated at 7:23 p.m. ET. 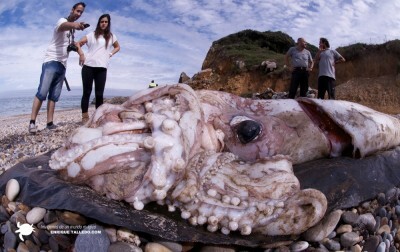 A giant squid, whose oversized eyes and gargantuan blob of a body make it look more mythical than real beast, washed ashore Tuesday (Oct. 1) at La Arena beach in the Spanish community of Cantabria. The beast measures some 30 feet (9 meters) in length and weighs a whopping 400 pounds (180 kilograms); and according to news reports, it is a specimen of Architeuthis dux, the largest invertebrate (animals without backbones) on Earth. The giant squid is currently at the Maritime Museum of Cantabria, according to El Diario Montanes.